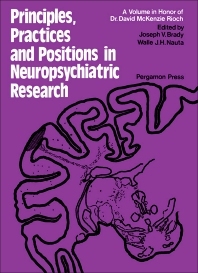 Principles, Practices and Positions in Neuropsychiatric Research contains the proceedings of a conference held in June 1970 at the Walter Reed Army Institute of Research, Washington, D.C., in tribute to Dr. David McKenzie Rioch upon his retirement as Director of the Neuropsychiatry Division of that institute. This book is composed of the original contributions presented at the conference, as well as several invited papers that could not be programmed at the meeting because of certain limitations. Topics covered in some papers focus on anatomy of the thalamus; glia-neuronal interaction; receptor characteristics and conduction velocities in bladder afferents; responses of photoreceptors; and specificity of responses of cells in the visual cortex. This text also discusses the channeling of responses elicited by hypothalamic stimulation; neurochemistry of reward and punishment; behavioral analysis of aphasia; and biology of sleep. The military psychiatry and changing systems of mental health care, as well as psychological issues in training for research in psychiatry are also addressed. The contributions in this book will serve to reflect the remarkable range of bio-social research interest and competence. Chapter 8: IS PAIN A SPECIFIC SENSATION?